A very exclusive press conference was held with founders of the 'Nobu Hotels' on Wednesday, May 16th, 2018. 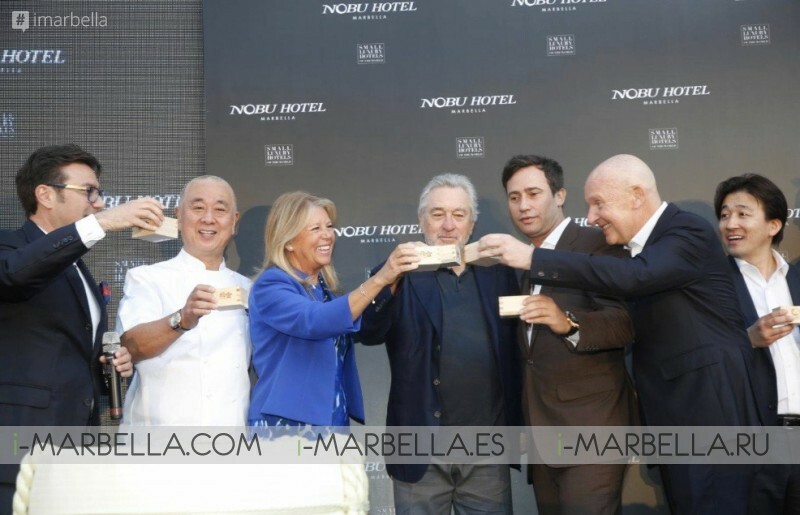 The owner Daniel Shamoon, owner and executive chef Nobu Matsuhisa, co-founder and Hollywood star Robert De Niro, the director Meir Teper, the director of operations Struan McKenzie and the Executive Director Trevor Horwell celebrated together the inauguration of the 'Nobu Hotels in Puente Romano Marbella. 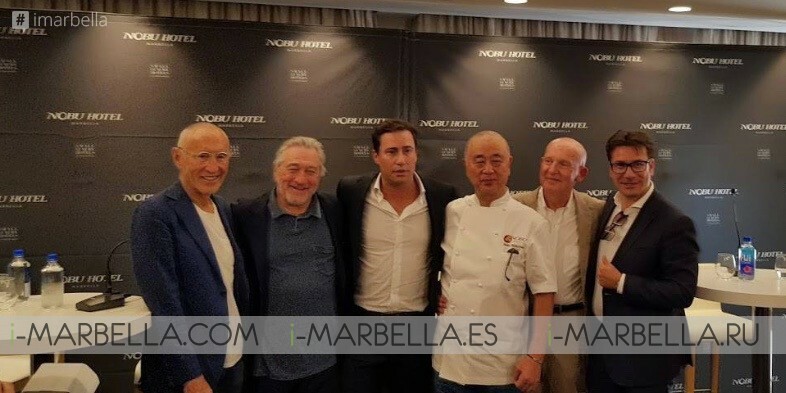 The legendary American actor Robert de Niro inaugurated this Wednesday, May 16th, 2018, in Marbella the Hotel Restaurant Nobu, directed exclusively for the public adult, that belongs to the hotel chain that he manages together with the Japanese chef Nobuyuki Matsuhisa and Daniel Shamoon Puente Romano owner. The Hollywood actor De Niro said, he has great expectations about this project and is very happy with his visit to Spain, a place he has ensured to appreciate a lot. The hotel is located inside the Hotel Puente Romano, on the Golden Mile of Marbella, and has 49 rooms and suites with surfaces ranging from 45 to 120 square meters and the goal is to expand the number to 81 in the middle of 2019. Robert De Niro arrived in the morning of May 16th, 2018 at the Malaga Airport on a private flight from London, where they did the same ceremony a night before. The plane landed on the runway destined for these type of arrivals. From there he was moved by helicopter to Marbella to arrive finally at his hotel. He arrived around midday in Puente Romano, where inside is also located the Nobu Hotel. He went out for lunch at the "beach club", located next to the sea and which lead to a show time for those who were crossing him returning to Puente Romano by the Marbella promenade after lunch. De Niro, who was joined at a press conference with Matsuhisa and Teper, stated that he is a fan of good food and recalled that his business began with the opening of a restaurant 30 years ago in New York while shooting a movie. 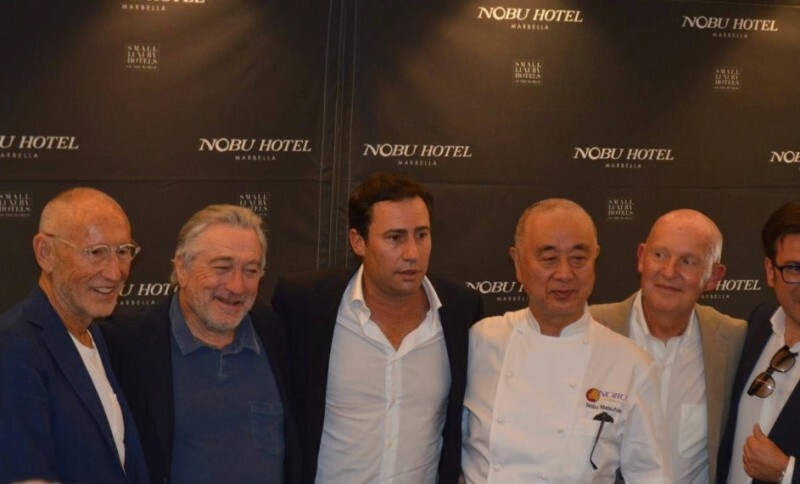 "It's a pleasure to be in Marbella today because I love coming to Spain," said the actor Robert De Niro a two-time Oscar winner, who is responsible for the creative direction of the Nobu restaurants. The first Nobu restaurant opened by De Niro, Matsuhisa and Teper as co-owners was in 1994. 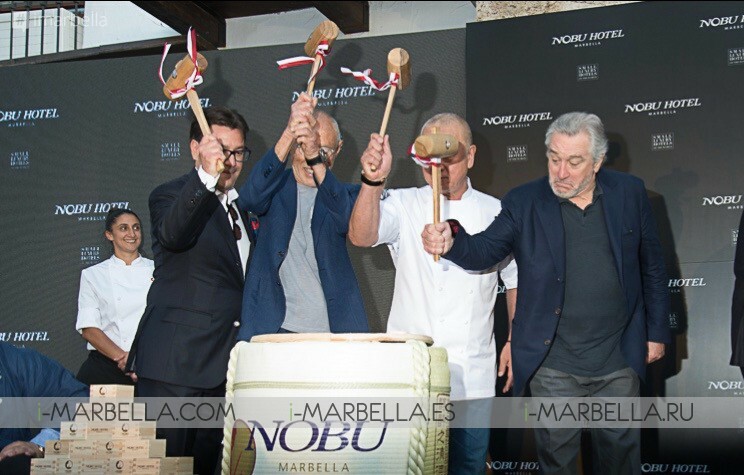 The inauguration route which started yesterday is planned to continue today May 17th, 2018, as the Nobu members will launch another Nobu Hotel in Ibiza. 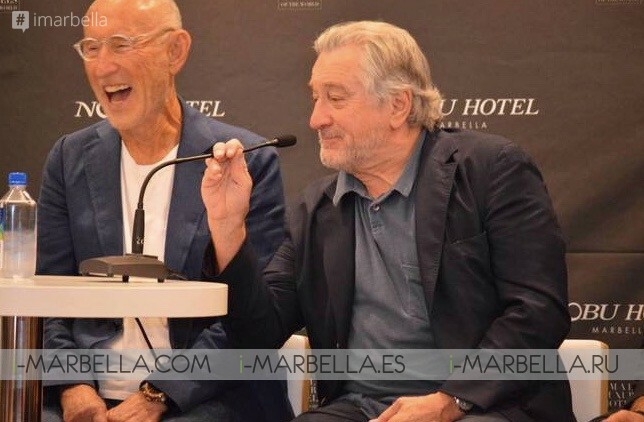 One of Robert De Niro's big moments during the press release in Marbella was when he talked about Donald trump current president of the USA: "If Trump happens to enter a restaurant where I am, I would immediately stand up and leave." De Niro has assured that, if the president of the United States, Donald Trump, would go to one of the Nobu restaurants, he would leave the hotel establishment immediately. Although the event was supposed to have nothing to do with political issues, De Niro did not hesitate when he responded to the question; ''what dish would he prepare for the current president of the United States, Donald Trump'', in which he replied; "If Trump happens to enter a restaurant where I am, I would immediately stand up and leave." It’s known that the actor has been characterized in recent years by not being straight to the point when talking about the American political situation. The interpreter has expressed his disappointment with the current political situation and the Trump administration, which cut the budget for art and culture. Continuing with the Nobu Hotel Inauguration; The director and producer also recalled that his relationship with Nobu goes back more than 20 years when he opened with the Japanese his first restaurant in New York while filming a movie in the city of skyscrapers, which has generated a chain that expands on five continents. De Niro pointed out that he started his business career with the hostelry industry when he questioned himself about the food at the Hard Rock Cafe in San Diego and the opening of restaurants followed by hotels related to those. Nobuyuki Matsuhisa who considers the actor as part of his family mentioned that even though throughout the time they had small disagreements, he highlighted during the press release about the close friendship they have since so many years and how they managed to stay together with the desire to continue growing. Since its inception, the Nobu philosophy has consisted of creating unforgettable experiences accompanied by spectacular dishes. Thus, in the years that followed its inauguration in Tribeca, the Nobu brand has become synonymous with instinctive design, quality ingredients, strength and passion for good service. As artists, chefs and restaurateurs, the owners of Nobu and the visionaries behind the brand managed to accumulate a lot of experiences all over the world. His commitment to bringing the best of these enriching experiences is already an essential part of the history of Nobu hotels and restaurants. Hollywood producer Meier Teper has assured that the hotel chain, which has a presence in Ibiza and London, will open a new establishment in Barcelona next year and intends to settle in Madrid and start the expansion through Portugal. "We are more than good friends, almost like a family, and together we are very strong," he said. The aim of Nobu has always been to completely revolutionize the hotel industry, under the firm conviction that hotels and restaurants can be perfectly integrated. For this, they opened several high-end restaurants capable of attracting a select clientele of trend creators, influencers and style designers. Always faithful to this brand of luxury and distinction, each Nobu hotel is different from the others, reflecting the local personality of its enclave while deeply committing to it. Nobu is a globally recognized brand that knows how to take advantage of the local market. Robert De Niro new hotels inauguration has a partnership with Puente Romano. Within the inauguration, there was also time for a traditional sake ceremony. In which the barrel from this Japanese drink is broken to create good fortune in the future business. An ancestral ritual that was born 300 years ago by the hand of Tokugawa Shogun, a warrior who implanted it as a prelude to battle, to gain luck in combat. 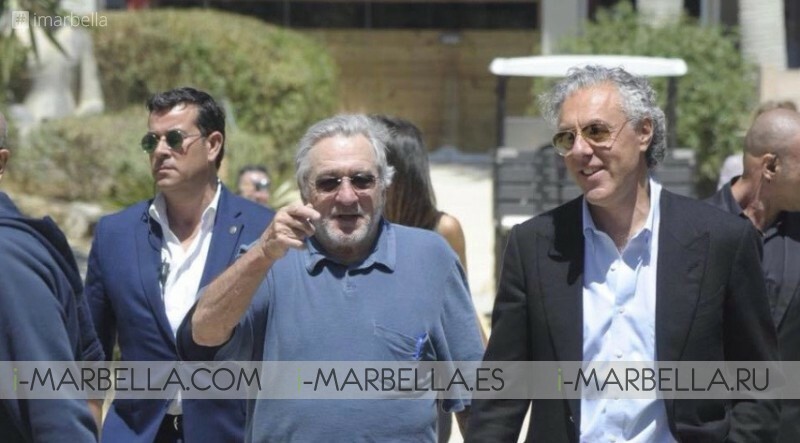 And the celebration was not trivial, because De Niro and his partners, the chef Nobu Matsuhisa and the producer Meir Teper, intend to use Spain as the start of operations for the planned expansion throughout Europe. An expansion in which the actor does not expect the visit of the current president of the United States, Donald Trump: "If Trump happens to enter a restaurant where I am, I would immediately stand up and leave." The Sake Ceremony is a special Japanese tradition that marks down the official opening of the Nobu Hotel. This tradition consists on after filling a barrel of sake with a branded Nobu special sake, the Co-founders break the top barrel with wooden mallets. Next, to that, the sake is served to toast with all people part of the ceremony as a sign of good luck. Named one of luxury's 25 Most Innovative Brands by Robb Report, Nobu Hospitality is ranked among an elite selection of global luxury brands. The natural growth of Nobu hospitality, built on service, image, and reputation, offers the complete spectrum of a hotel, restaurant and residence management for unique projects around the world. Founded by Nobu Matsuhisa, Robert De Niro, and Meir Teper, with operations spanning five continents, the Nobu brand thrives in the world's capitals as the ultimate destination lifestyle experience. The first Nobu hotel opened its doors in 2013 in Las Vegas, in 2014 in Manila, in Miami in 2016, London and Palo Alto (California) in 2017 and the Nobu business group plans to open new plants in Barcelona, Riyadh, Los Cabos, Chicago, Toronto, Sao Paulo and Atlanta. Highly acclaimed actor, director, producer and two-time Academy Award winner, De Niro was instrumental in bringing the artistry of Nobu first to New York and around the world. As a core principle of the group, he has co-founded and provided creative direction for all the Nobu restaurants and he continues to provide creative leadership and insight into the development of Nobu Hotels for years to come. His support of the brand draws actors, musicians, and socialites from around the globe. Nobuyuki Matsuhisa, known to the world simply as “Nobu” is the acclaimed and highly influential chef proprietor of Nobu and Matsuhisa restaurants located across five continents. Born and raised in Saitama, Japan, Nobu served a rigorous apprenticeship at a respected sushi bar in Tokyo. It was not long before his dreams of seeing the world moved him to open a sushi bar in Peru. A classically trained sushi-chef, Nobu was challenged by the new culture and regional ingredients, which kindled his inventive style, known today as Nobu Style. Meir Teper Hollywood film producer Teper, in conjunction with De Niro, convinced Chef Nobu Matsuhisa to open the first restaurant and has been instrumental in the growth of Nobu on the world stage, to the inauguration also assisted Struan McKenzie is the COO for Nobu and Trevor Horwell, CEO Visionary of the bespoke hotel business.